To fully understand the history of flag football, one must go back to the 19th century and the birth of tackle football. Originally created somewhere in the mid-1800s, the first game of college football was played between Rutgers and Princeton in 1869. Twenty-six years later, the professional version of the game would make its debut. While modern football is certainly violent, it�s a far cry from the sport�s more brutal early days. Numerous people died on the field during that period, and college football was eventually forced to institute new rules to keep from being banned. It was during this time that people started looking for a way to enjoy football without exposing themselves to serious risk of injury. Touch and Tail Football was first known to have been played in the 1930s, and the phrase �touch football� is dated in Webster�s Dictionary as �1933.� Numerous touch football leagues were known to have existed in places such as Queens, New York. As America prepared to enter World War II, troops stationed at military bases needed a way to blow off steam. 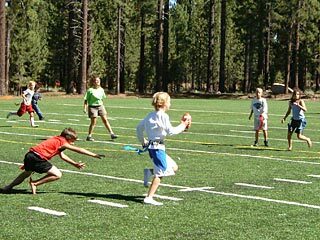 Since playing traditional football might result in injuries, flag football was developed as a compromise. While Webster�s does not have the term �flag football� listed until 1954, the game is believed to have started in the 1940s (with Fort Meade in Maryland as its generally-accepted birthplace). Recreational leagues were soon developed to make the sport more organized (with a format similar to softball leagues), and it grew in popularity as active young men returned home from the war. Flag football continued to gain momentum throughout the next several decades, although the 7-man intramural games of the 60s and 70s faintly resembles the modern brand of flag football. Sometime in the 1960s, the city of St. Louis formed the National Touch Football League. Their first national championship game was played in 1971. In addition, they produced the sport�s first rulebook and introduced a Hall of Fame to recognize outstanding players. The University of New Orleans held its first-ever �Collegiate Intramural� tournament in the late 70s. 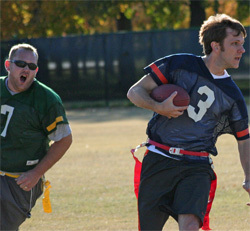 The success was overwhelming, and it has since developed into the annual National Collegiate Flag Football Championships. Since it enjoyed so much success on college campuses, many students graduated with a love of the game and wished to keep playing after their college days were over. This resulted in even more flag football leagues springing up all over the country, as well as national competitions to crown the best overall team. 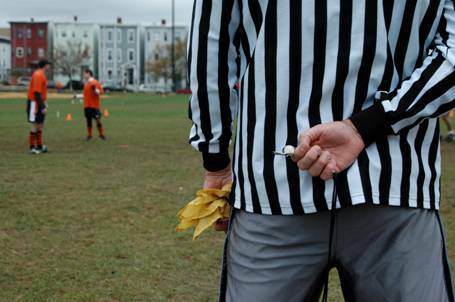 The largest non-college tournament is the USFTL National Flag Football tournament. Held annually in Orlando, Florida, it draws hundreds of team and crowns numerous champions in different categories. In 1991, the AFTFL was formed. It now conducts an annual national championship tournament (held in Atlanta each February). Many other national organizations also exist in order to satisfy the needs of the over 20 million flag football players. In 1997, a meeting was held between the directors of the major flag football organizations. Each agreed to have the top 9-man teams in the nation compete in regional tournaments, with the top two teams meeting in the �Pro Flag Bowl.� This was the beginning of the Professional Flag Football League, Inc., and a step in the direction of unifying the leagues and crowning a single national champion. The Professional Flag Football League went on the road in 1999, with teams playing a professional travel schedules. The league included teams based in Buffalo, Columbus, Cleveland, Toledo, Dayton and Indianapolis. Three teams went under before the end of the season, however, and the league championship game failed to take place. In recent years, the NFL has begun to heavily promote flag football as a way to get more people interested in their product. 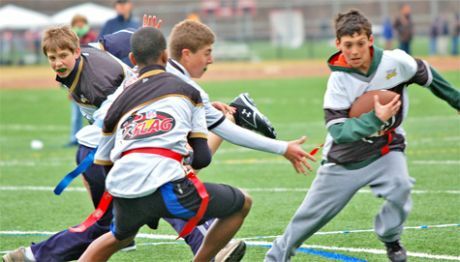 In some NFL cities, annual flag football tournaments are held, and hundreds of teams register to compete. Some observers believe the NFL might be the unifying force which many in the flag football community have so desperately craved.